In this episode of the College Marketing Podcast, we talk to Jennifer Aradhya about strategies and tactics for social media engagement. 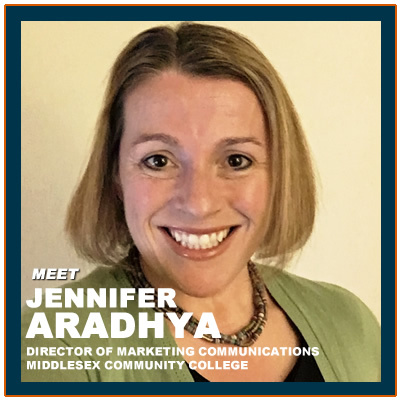 Jennifer is the director of marketing communications at Middlesex Community College in Bedford, Massachusetts. She recently gave a great presentation called the New Social Media Mission at the NCMPR Conference in St. Louis. In this presentation she gave a lot of great examples of how MCC is doing more than just making post on social media. They are actively seeking REAL engagement with their audiences through really fun and creative social campaigns. If your community college struggles with getting deep engagement with your audiences, you will not want to miss this episode! It is full of real-world examples that you are definitely going to want to consider for your school. You have had a pretty long career in higher education. Tell us a little bit about your career journey and how you came to be the director of marketing communications at Middlesex Community College. Aradhya: Sure. I’ve always worked in non-profits and doing marketing. I started doing continuing [inaudible 00:01:17] education and moved to Middlesex Community College as a designer in 1997. I’ve been here for about 19 years. Went back to school, got my graduate degree and then became the director or marketing communications in 2012. I saw on your bio that you also are a fine artist as well. Medford: Cool, what sort of medium? Aradhya: I do mixed media. A little bit of paper and painting and photography. I’ve shown at a bunch of regional shows and galleries. I actually have a studio in Western Avenue Studios. It’s one of the largest artist collaboratives. That’s in Lowell, Massachusetts. That’s awesome. My wife is a fine artist as well. I’m definitely into that. She’s a art teacher. Medford: Is that something you’ve done a long time or kind of a recent thing? Aradhya: I sort of came back to it when I became the director. I was doing more administrative type work and I wanted some sort of creative outlet. I still get in the trenches and hands-on, but sort of budgets, and data, and forecasting takes up a good amount of time. It was good to get back to my roots and go back to the studio and play. I just bring my dog and my two kids. We have a blast. Medford: That’s awesome. You’ve got to have that left brain outlet for sure. Aradhya: Absolutely. It’s been wonderful. You were at the NCMPR conference in St. Louis recently. What did you think of this years show? [00:03:00] It was pretty amazing. We love going to the NCMPR conferences whenever we get the opportunity. We had a wonderful time. I got to bring two staff members. We all covered all the different sessions and came back and had a debrief lunch. We learned a lot. Medford: Nice. It’s always a good time to go learn. Did you get to enjoy St. Louis a little bit as well? Aradhya: We did. We finally made our way down to that arch, despite all the fences around it. Medford: That was a shame. Aradhya: It was a shame. It was such a tease. Everything involving St. Louis involves the arch. Our hotel was right on the arch, pretty much. It was too funny. We had some great barbecue. Medford: Did you go to Pappy’s? Aradhya: We went to Pappy’s. Absolutely. Bogart’s was closed. We heard Bogart’s was the place to be, but Pappy’s was phenomenal. Medford: I heard it was number 5 in the nation in barbecue. It was so good. Right. It was delish. We got to do a little exploring. Medford: I had one say where for whatever reason I didn’t eat breakfast, I didn’t eat lunch. I went for a five mile run across the bridge to Illinois and back and then I went to Pappy’s. I was like full rack or ribs or half a rack? I could totally destroy a full rack of ribs and I did. It was good. Aradhya: That’s funny. The sides alone. It was the fried corn coated in salt and sweet potato fries dipped in sugar. They were just amazing. They were mad geniuses. Medford: Absolutely. If you go to St. Louis, you have to go to Pappy’s. Hands down. Aradhya: I felt lucky that sort of stumbled upon it with our Yelp app. That’s how we ended up in the area. That was wonderful. You did have a breakout session while you were there called the New Social Media Mission. Was this your first time presenting at NCMPR? No, we’ve taught in past conferences. Mostly social media. We do a lot of social media engagements. My colleague, Beth Noel, has presented on email marketing and things like that. We do try to present, if not at the district, at the national level annually. You guys are doing a lot of really innovative things with social media at Middlesex Community College. I’m excited to talk to you about some of that. Just to kind of get us started, what are some of the social media platforms that you guys use? Obviously you can’t do everything. What do you manage and manage well over there? Aradhya: Our largest audience is on our Facebook channel. We also use Twitter, Instagram, YouTube, and Pinterest. We used to do Google+ and we held in there for a long time, but recently decided our efforts were better spent elsewhere. Yeah, absolutely. They pretty much said they were basically giving up on it for all intents and purposes. Aradhya: Even they gave up on it, so I figured it was time. Medford: Yeah. If they give up on it, it’s time to give up on it, for sure. Aradhya: It had such potential. One thing that’s different about you guys, I don’t think a lot of people are using Pinterest, a lot of community colleges. Why are you guys on there and what are you doing with Pinterest? Aradhya: We do a few interesting things. Our students are building e-portfolios as part of their resumes and they bring their course work out into the world. We have an e-portfolio showcase. We have some of our best students work. They create them in WordPress. It was a repository we created to showcase some of their best work. People have found that sort of interesting, and an interesting use of Pinterest that falls outside of the cupcake recipes and exercises and things like that. [00:07:00] We also have an inspirational board. We have a board about community colleges and famous people that have come and graduated from community colleges. We have some fun tips about taking courses during the summer and fitting in summer courses. We have a financial aide board about tips to get through that process. We do a little bit of different things. We promote some of our programs. Around that time if there’s certain programs we’re promoting or new programs, we sort of build a board related to more information about a career in that program, some facts about it, the program sheets. Things like that. Medford: That’s a really neat idea. Pinterest isn’t that hard to manage once you do get it up and going. You don’t have to worry about YouTube comments the way you do in other platforms. Exactly. We’re able to share content that’s outside of Middlesex, which we also enjoy. We can promote some other resources and newspaper articles, things like that. We have a best of our blog. If somebody is just looking to not have to go through years and years of blog posts, they can go there as well. In your presentation, you had some different game changers. Game changer number one was having fun with your audience. Why is having fun with your audience important, and what are some ways the MCC has done that? [00:09:00] What we originally used social media is pretty much a billboard. We wanted to share our news and then we weren’t prepared for Twitter comments and engagements when we started in 2009. We sort of flipped the table on that and decided to start having fun with our audience and engage them. We have challenges and contests. One of our favorite ones was having students use Instagram to document their first 30 days at the college. We sort of gave them prompts or things they had to do each day. Whether it’s your bag, they had to photograph their bag, their sunglasses, things like that. We gave them concepts to follow, but what they came up with was just wonderful. When we put all the entries together, it made such a beautiful story about students journeys for the first 30 days at campus. Medford: That’s awesome. That’s part of the Instagram challenge? I also saw that you guys are doing something called Heart the Arts. Aradhya:[00:10:00] Right. We did a Hearts to Arts campaign. We have a magazine on campus that we send out to alumni and businesses. It’s called Profiles Magazine. The only reward for this challenge is that you would be published. We asked students to share their artwork with us or what art means to them using hashtag MCC Arts or MCC gram. We then added it to a Facebook gallery to share. Then we ended up publishing it as our last page of the Profiles magazine. People really enjoyed seeing their work printed. Aradhya: It created a great collage of images. The kids are very talented. Medford: I assume you have a pretty healthy arts program there. Aradhya: We do, yup. We have an arts program. Both music, theater, studio arts. You also did a mission challenge. You have a new mission there. Everyone teaches, everyone learns? Aradhya: [00:11:00] Yes. We did this, it was an accreditation year. It was time for our 10 year self study. We had just launched a new mission statement and we wanted to make sure it was on everyone’s radar. We used our MCC Mission challenge as a way to sort of promote our mission statement, and the tagline “everyone teaches, everyone learns.” They were asked to complete 10 challenges on different platforms. It was wonderful. People really were able to recite our mission by the end of it. Aradhya: One of the cool things about this, and I actually didn’t even get to say it in the session, is that we have a very large online population of students. We wanted to make sure that our students who are off campus have this challenge be accessible. One of the students that one was actually overseas studying in England. He was able to win, so mission accomplished. You also did a campaign called MCC Cares? Aradhya: [00:12:00] Yes. We have a big service learning program on campus and our students are doing wonderful work within the community. We thought that this would be kind of a fun way to highlight this work. It’s sort of another bonus is we ended up meeting all sorts of interesting students. We had one of them get a fellowship and wrote stories for us. We ended up meeting the students who were in the Jumpstart program. The two winners of MCC Cares, we actually brought a part to them and celebrated with the children and gave out teachers. It became a very fun event. It took on a life of its own. You also did an MCC Grad Proud of My Selfie campaign. It incorporated a photo frame, which I thought was a really cool idea. Aradhya: [00:13:00] We have a wonderful facilities staff here. They made us a photo frame out of foam core and PVC tubes. We were able to change the hashtag as needed. We used it on opening day for MCC Success. For those particular days we used MCC Grad. Our president got in on the action, our alumni award winner had photos taken in there. It was really fun. Do you find that having a prize is key to making these campaigns successful or not necessarily? Aradhya: I think prizes help, but it certainly doesn’t deter your core audience or social media enthusiasts from participating. Again, just having things published or giving a t-shirt or giving props as being part of a Facebook gallery that we’ve selected seems to be incentive enough. Aradhya: Whether it’s sort of social prize or an actual prize. How are you promoting these offline as well? Aradhya: We use every possible medium. We have signage around campus. I’m sure most colleges have the same issue, we have spaces that have many, many posters in them so you’re sort of competing. They all sort of blend into one after a while. We created little table tents, similar to what food courts have. We find that those are a little more intimate and people tend to pick up the information more. We swap those out monthly. That’s a medium we use. Depending on what it is, we have a register early campaign going on right now. In all the advising centers we have post cards with all this information. It’s send out via our student newscaster, it’s on the monitors. Anything we can, we use. Your game changer number two is having real conversations with people. What do you mean by that and can you give us some examples. Sure. It wort of goes back to that original billboard theory. Putting the information out there and the moving onto the next thing to promote. We set up a network of admins, and this is particularly for Facebook and Twitter, so that people have access to our account that are experts in financial aid or in admissions and can answer the questions as they come in. That has really helped creating a process and protocol when there is a question that we want to answer it. We don’t want to just leave the student hanging. It’s like calling L.L. Bean to complain about something and being left on hold indefinitely. You don’t want to frustrate somebody if they have an issue. They sent you a message or posted to something, you want to respond. [00:16:00] We don’t take things offline. If somebody has a complaint about getting charged for a course that they and dropped or confusion or frustration about registering, we answer it right there on the page. We do make sure that we are able to follow up with them with a phone call if that’s how they prefer to do it. We feel that leaving this information out there, people have found helpful. The two examples, a woman had a daughter who had to have blood drawn, went to the local hospital, has blood drawn from the small child who was very afraid of needles. She had an amazing experience with one of our nursing students and just reached out and wanted to tell us this story. Of course, that’s one of those wonderful things that fell from the sky. We were so excited to share that with out nursing faculty. [00:17:00] On the other side we had a student who at 2 am was sort of raging about a situation with registering, a lot of frustration. Once we were able to get to it the next morning about 8 am, we responded all hands on. We reached out to her by every sort of means. By 11 o’clock she was thanking us, saying, “I’m so sorry. I was venting. I can’t believe all the attention I’m getting. Thank you so much.” It really did turn out to be a better situation. It was wonderful to have her appreciate those efforts. That is how we treat these engagements with students. We want to get to the bottom of it and resolve it for them. Medford: You turned that person that was upset at you into an advocate for you. Aradhya: Right. It’s an opportunity. You put a lot into training your staff and faculty on social media, which I think is incredibly smart. What sparked that idea and how do you go about implementing the training? It sort of came about where, we’re a staff of nine, six full time, three part time. We do everything. All the [inaudible 00:18:05] within the college, from press releases to advertising. I do the media buys. It just wasn’t possible for us to do every possible thing for every department that wanted to promote something. Sometimes it didn’t make sense for our official page to have such detailed information about a certain club or certain department. [00:19:00] We started creating allies. People who are interested in social media, people who are using it personally and letting them know that they could have a departmental page or they could have a program page or a student club page and to go through our training so that we would give them best practices, how we’re using it, how we can support them in this initiative. Sort of army men with the information they need to start up, which has led to us having a directory and a whole assortment of protocols and procedures at this point. We set up training through our professional development department. We try to do it a couple times a semester. We had training with a group of seniors on campus, lifelong learners. We’ve had training with them to introduce them to our social media platform. Any opportunity, we will talk about social media. Not everyone can have access to the colleges social media accounts, although I’m sure they would love to. How does faculty and staff go about requesting items be put on your main social media accounts? Aradhya: [00:20:00] Much like our print communications and our digital communications, we have a social media request form that they need to fill out. We prefer a 14 day advance notice because we really do try to plan out our social media ahead of time so that we can leave room for the unexpected. They just submit their information on a form. Again, this is if they’ve chosen not to do their own page. Once we let people know what it takes and what the expectations are for posting on social media, we have at least 60% of the people who come to training decide not to pursue their own pages. They realize it’s a lot of work. Then, we offer them the form and they’re able to submit their content to us. You mention planning. How do you guys plan? How far ahead are you on that? What tools do you use to plan your social media campaigns? Aradhya: [00:21:00] He do use Hootsuite. For the most part, we do use live posting. When there are breaks or long weekends or whatnot, we do post on the weekend, we’ll use Hootsuite. We plan about two weeks ahead. We like to have sort of a two weak plan factored in. We have a longer term, sometimes up to three months if we know that there’s something like register early coming up, or graduation, we’ll at least have a plan of how we’re going to roll it out. It’s important to have a student social media policy. What does yours contain? [00:22:00] It’s more of a code of conduct, and this is for our currently enrolled students, that they’re respectful and honest. It’s very similar to our campus code of conduct. They need to respect copyright and fair use, unsolicited or unauthorized advertising will be removed, such as spamming. There’s always local vendors and stores and things like that. Derogatory comments are removed. They’re not permitted. To [inaudible 00:21:59] content to any of our pages, they are understanding and acknowledging. This information is available to the public. Do you run into situations where you have to use this policy and reference it and take action? Aradhya: There has not been a lot of it. I think since 2009, we’ve probably had to ban two people from our page, or block two people from posting to our page, which is pretty amazing when you think of our numbers and how active people are on our pages. We find that Facebook in particular will weed out a lot of posts. I want to say, I don’t know what particular area of the country you’re in, but here where there’s snow, that’s when everyone comes out of the woodwork, is when snow is not cancelled, and inappropriate language will sometimes rear its head. They cancel school for snow in Massachusetts? Aradhya: Right. Or they don’t or they have a delayed open, which happened this week. Medford: Yeah, I was in Cambridge a month ago and as soon as I got there, it started pouring down snow. All night long, I heard snow plows going up the road. I’m from North Carolina, so this is all news to me. Medford: Seeing all the specialized equipment that cleans the sidewalks off, and seeing the salt workers everywhere. Medford: It’s an army or people that are there to prepare. It’s amazing. Aradhya: It takes it in order to keep the city moving. You guys put a lot of emphasis on branding your graphics, which I don’t think enough colleges really stress this. What is your strategy behind that? Aradhya: People share content. You want to make sure that it leads back to the institution. We’ll do some reasons to register early or some tips and tricks, some fun facts, things like that. A little kitten hanging from a string, “Let’s hang in there,” around finals. Having things branded and having them look a certain way I think has really added to our page. We’ve won numerous awards on our social media and judges often comment that the pages look good. Having that plan in place and having that two week lead time allows us to identify which posts need images and make sure they get put in for our graphic design work flow. I think it turns out well. We have a digital asset management so that we’re able to reuse things. We try to keep things as timeless as possible. You have your own street team. How did this come about and what do they do for you guys? [00:26:00] This has always been sort of a dream of our department is to have that authentic student voice. We can be out there as much as possible, but to have a student tell your story is just amazing. It’s just wonderful. We were finally able to get together a position. It operates as an internship, a paid internship within our department. We work with them to sort of let them know how professional social media operates and they’re out in the field. They have their own set of accounts using Instagram and Twitter. They’re posting all sorts of fun things. I tell people that they’re able to use emoticons a lot more liberally that our official page is. They have a lot more fun. They make fun designs out of paperclips. We just had our street teammer Keagan, she put together a snow man this week and dressed it up in MCC gear. They’re just able to take a lot more creative license. It’s been wonderful. You can’t do everything that you guys so without having buy in from the top leadership. Did you just get lucky with the right president, or did you really have to talk the leadership team into getting behind you with all of your social media efforts? Aradhya: Our president, who had been here for 24 years, had retired last year. Although she wasn’t a huge user of social media, she understood its importance and supported us continuing to improve our social media efforts. That was wonderful. We wouldn’t be where we were, certainly. Especially in 2009, when I know a lot of community colleges within the common wealth were not ready for it. We’ve always had that support. [00:27:00] Our new president, Dr. James Mabry, who came last year in February, is very into technology and appreciates how technology is able to connect people and really wanted to start his own social media account. He started with Twitter this past fall. He loves it. Just having somebody who gets it and uses it, we worked with him to get him up to speed as far as best practices and some recommendations, and things like that. He’s just taken off. He’s live tweeting from conferences he’s attending and community events. He’s tagging, using the right hashtags, and tagging the right people. It’s been wonderful. He’s just taken off. Medford: That’s great. You can really tell when a president, someone else is doing it on their behalf. It’s really refreshing. [00:28:00] That always, always, always shows through, so it’s wonderful. I think when I was presenting this, people sort of were looking at me like, is he really tweeting? I was like, “He really is.” There was actually two of my favorite posts he did. The first one was the lights went out on one of our buildings on campus. He went there and all the students were assembled in a student common area. He grabbed a couple of the students and they went over and bought Dunkin Donuts and a couple boxes of Joe’s and he tweeted about it. It was a really cute, real moment that you don’t normally see. Another one of my favorite ones, he’s out and about a lot and meeting with students and stopping and having great conversations. There was this student who had been plowing all night, again the snow theme in Massachusetts. He stopped to chat with him and after plowing all night, we was still on time for his 8 or 8:30 philosophy class. He sort of gave him a shout on on Twitter. [00:29:00] He’ll respond to people. People sent also congratulations for his inauguration this past October and he responded to every single one of them. I think people were surprised but happy. Do you have any advice for marketing directors out there that are trying to pitch the idea of getting buy in for social media from leadership? [00:30:00] I think the best thing they can do is provide examples, peer examples. I think that that was helpful, to see what other presidents, whether it’s for your institutions or to your institutions, but provide some solid examples of what’s being done or what can be done. Then maybe some suggestions of how they can utilize it and not have it become a full time job. I think that that’s a concern, it’s such an important demanding job to add another level, to sort of show them how it does help people build community, whether it’s outside constituents or with students. It’s really been wonderful. I think you sort of have to paint that for somebody who’s resistant.